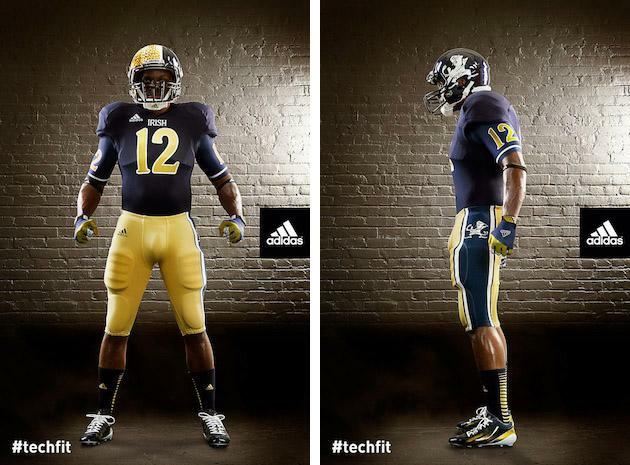 Notre Dame's uniforms have officially jumped the shark. The university and Adidas released the new Shamrock Series uniforms for the Oct. 6 game against Miami at Soldier Field and they are wildly over the top. OK, let me back up here. The jersey isn't over the top. It's a basic navy with Irish on the front and the numbers in gold on the front and back. The gold pants are a little goofy with the navy and white down the side and the fighting Irishman threatening to punch the thigh pad. But where the whole uniform loses it, where it becomes The Fonz on water skis, is the helmet. What is that? It's half Vegas galore and half boxing Irishman. It's the Two-Face of helmets. Granted, this isn't the first time the Irish have used the gold glam on their helmets. Last year's Shamrock Series game against Maryland featured all-gold helmets with giant green shamrock stickers. Even though those helmets looked a little goofy, I definitely liked them better than these identity crisis helmets. Honestly, I like Notre Dame's tradition gold helmets which are simple, plain, Notre Dame. And I even liked them with the throwback uniforms the Irish wore against Michigan last year. I appreciate that Notre Dame is trying to spice up uniforms that have been the same since the Byzantine Era, but honestly, why mess with one of college football's great traditional uniforms? • Can Dale Earnhardt Jr. pull off the difficult Michigan sweep?